Crystal Clear Pickups '50's Era Stratocaster pickups. Slightly under wound in comparison to our 60's set. Hand wound with 42 Formvar wire. Alnico 3 magnets with staggered poles and beveled tops. 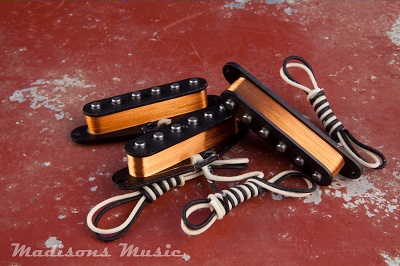 Our 50's strat pickups offer the classic bright clean tone you would expect out of an early Strat. The response and attack is almost identical. Nice noticable mid range and clear overtones.